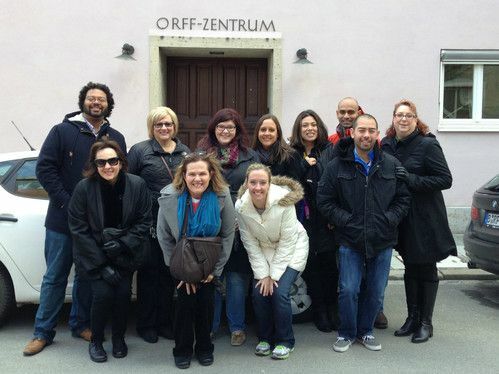 ​This morning was dedicated to our visit to the Orff Zentrum. This unassuming building at 16 KaulBachStrasse houses the official archives of Carl Orff. All of the original manuscripts are kept here and made available to researchers. The upper room is a large concert hall for performances and lectures. 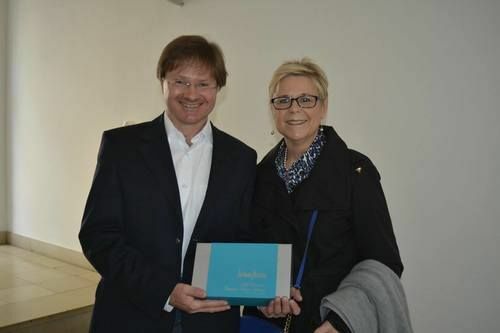 Dr. Thomas Rauch, director of the Zentrum (pictured here with Dr. Julie Scott from SMU), gave us a tour and talked about the history of the building. In the 1960's the building was owned by the Bavarian State. After Orff's death in 1983, his widow began looking for a suitable location for this papers and went to the government looking for assistance. They agreed to give her one of several state owned buildings for this purpose. She chose this one without knowing the history. 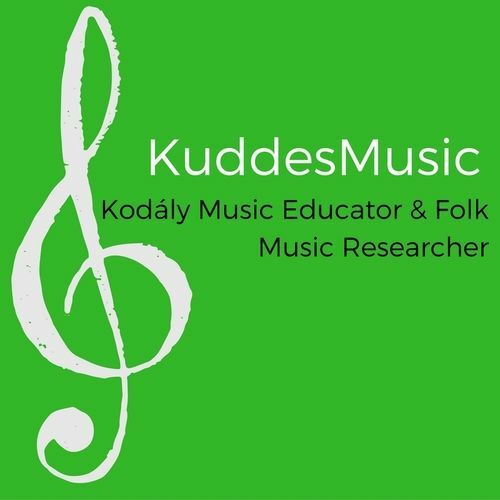 In 1936 the Günther Schule was looking for a larger space, as the popularity of the Rhythm and Dance program Orff, Dorothee Günther and Guinild Keetman had created began to grow. They settled on this particular location on KaulBachStrasse and held classes there until the Nazi Governor closed it down unexpectedly in 1944 after watching the girls dancing and playing drums in the garden. A bomb fell on the building in 1945 and it burned to the group with all the books and instruments of the original Schule still in it. After the war, a wealthy gentleman bought the property and decided to use the original plans to reconstruct the building. Frau Orff didn't know any of this, but she instinctively selected the former Günther Schule as the location for Orff's Archives, so a visit there is also a visit to the location of much of the early work of the Schulwerk. ​The afternoon was free of group activities. A number of us returned to the Old Town and had lunch at Dallmayr Delicatessen, then the shopping began! Several of us went down the street a short distance to a small traditional dress shop that Julie and I have visited previously. The men looked at hats, I bought a gorgeous vest that I had been wishing for since my last trip here, and Kristin bought a traditional Dirndel (Bavarian dress & apron). We walked back through the Viktualienmarkt, a large outdoor food market with stall that specialize in fruits, meats, cheeses, flowers, jams and schnapps. Snacks for our long travel day tomorrow were purchased as well. I had dinner with Matthias Funkhauser, the president of the German Kodaly Society, at the Augustiner Beerhall. The wild boar in mushroom sauce was amazing, as was the company and conversation. I have a new friend and colleague in this gentleman! Thank you for visiting my page. I hope you will reach out and let me know what you are doing.